Failed states and international terrorism. 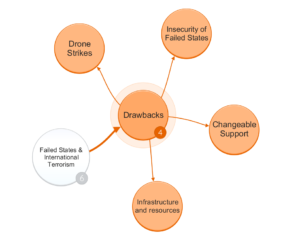 Examining the key questions: What is a failed state? To what extent can the links between failed states and international terrorism be traced? Why are there failed states with little or no discernible link to international terrorism? Since 9/11, there has been a marked rise in terrorism related studies and publications (Silke, 2008) with threats posed by international terrorists and failed states being widely examined. The well documented links between al-Qaeda and the Afghan Taliban (9/11 Commission, 2011) led to the US invasion of Afghanistan in 2001. President George W Bush stated that “America is now threatened less by conquering states than we are by failing ones” (The National Security Strategy of the United States, 2002). The securitisation of failed states was manifested in the US-led ‘War on Terror’, a central pre-emptive facet of Bush Doctrine. The severity of the emergent threat from sub-state actors challenged traditional Liberal and Realist thinking bringing in to sharp focus the dangers of ‘New Wars’ described by Mary Kaldor (2012). This begs several important questions: What is a failed state? To what extent can the links between failed states and international terrorism be traced? Why are there failed states with little or no discernible link to international terrorism? These questions are explored by examining prominent Sunni, Shia and non-Islamist terrorist actors linked to states including Somalia, Yemen, Sudan, Syria, Afghanistan, Iraq, Nigeria, Pakistan, Libya and Lebanon. 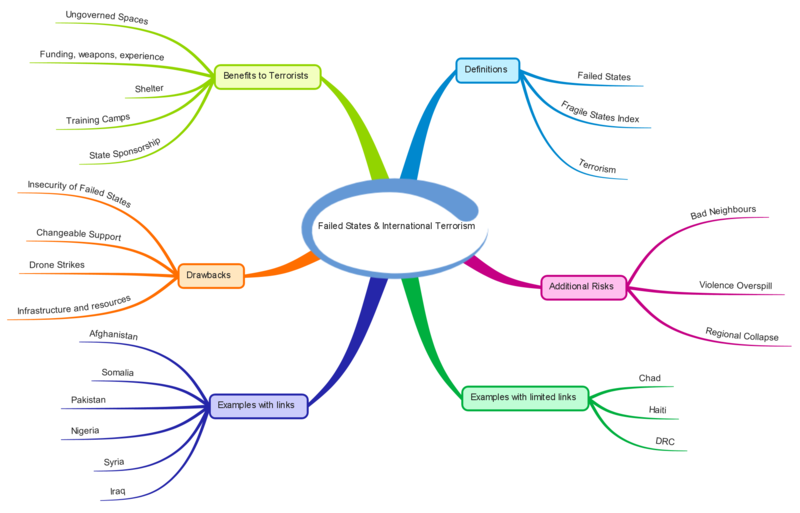 Analyses such as (Piazza and James, 2008) argue that failed states and international terrorism are intrinsically linked. The states’ loss of legitimacy and ability to provide security correlates with a rising acceptance of the use of ‘political violence’ among the citizens of failed states (Howard, 2016) and this goes some way to explaining their susceptibility to and acceptance of terrorism. 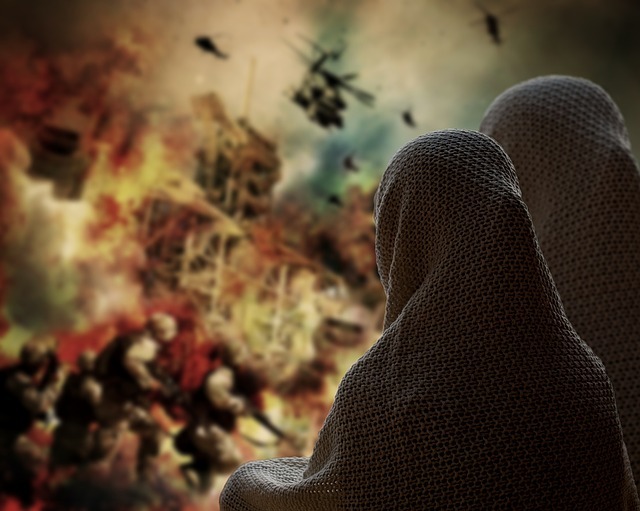 A prevalence of Salafi Jihadism and ideological receptivity within certain failed states also appears to indicate a significant link in some cases. convulsed by internal violence and can no longer deliver positive political goods to their inhabitants. Their governments lose legitimacy, and the very nature of the particular nation state itself becomes illegitimate in the eyes and in the hearts of the growing plurality of its citizens (Rotberg, 2003). In understanding the ‘positive political goods’ that Rotberg mentions and the degree to which these are provided by states, it is helpful to consider the annual Fragile States Index (2016) from the Fund for Peace. The Fragile States Index evaluates state fragility using 12 social, economic, political and military indicators and provides a helpful fragility scale against which to ‘operationalise’ Rotberg’s definition. There being no universally accepted definition of terrorism, Easson and Schmid (2013, pp. 99-157) compile over 250 descriptions, and a vast number of potential terrorist actors to assess, analysis is limited to a sample of significant international terrorist groups that are proscribed by several Western governments, the United Nations or the European Union. 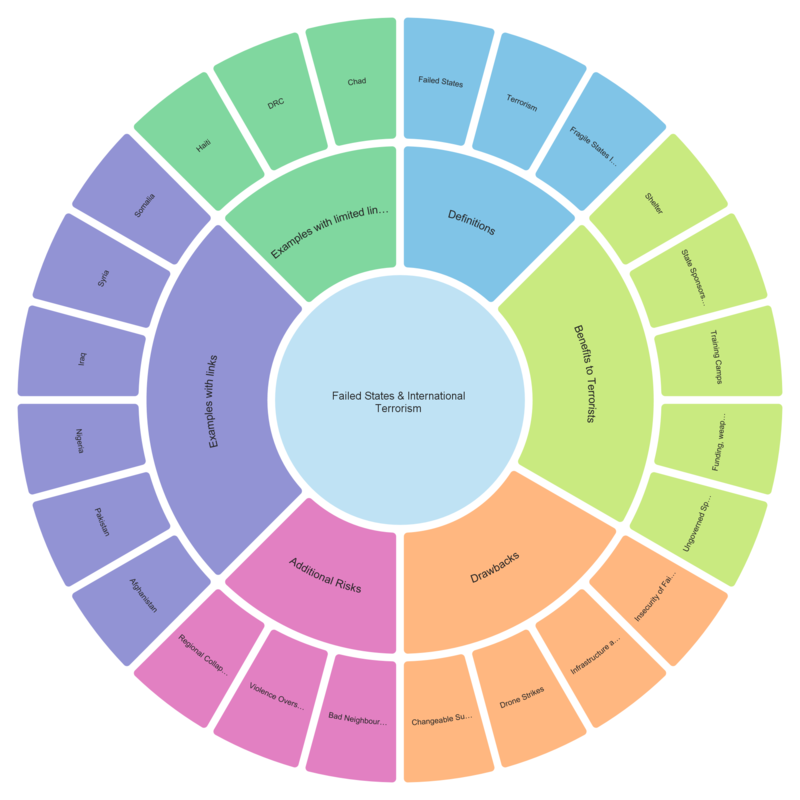 This sample is sourced from (Freedman, 2013, pp. 350-354) which compares proscribed and designated terrorist organisations from Australian, Canadian, Indian, Russian and American governments as well as from the European Union and United Nations. 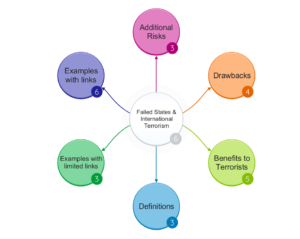 An explanation for possible links between failed states and international terrorists is the range of benefits such a relationship can bring to both parties. 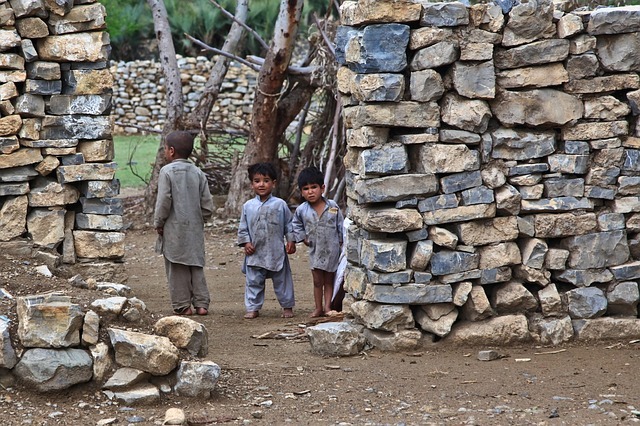 A failed state may provide safe-haven, funding and weapons (Patrick, 2007) and opportunities to engage in domestic and regional conflict (Afghanistan, Syria, Iraq and Yemen for example). This enables terrorists to gain field experience, refine weaponry and tactics and develop capabilities in association with their hosts. Lecture by Dr. Stewart Patrick author of Weak Links arguing that fragile states are primarily a risk to the citizens of those states. In Pakistan and Afghanistan, porous borders and ungoverned regions provide relatively free movement and levels of anonymity to international terrorists, arguably reducing their counter-surveillance and counter-intelligence risks. As in the case of Somalia, Syria and Afghanistan it may be difficult for intelligence services to distinguish international terrorists from indigenous actors. Ethnic and ideological sympathies afford additional layers of protection as evidenced by the relationship between the Taliban, al-Qaeda and Pashtun tribes in Afghanistan and Pakistan. These factors are important in understanding the utility of a failed state to certain classes of international terrorist. Other opportunities include expansion of territory, illicit trades including oil, drugs, weapons and diamonds (Simons and Tucker, 2007), (Patrick, 2011, p. 77) and proximate foreign targets. Weak but functioning host states can also provide terrorists with new identities, passports, money laundering and other financing facilities as well as a degree of ‘perimeter security’ (Mobley, 2012, p. 114). In return, foreign fighters have supported their protective hosts in conflicts in Sudan (Ibid., p. 105) and Afghanistan. Failed states also present significant potential downsides to international terrorists. These can be understood in the context of two variants of ‘host-state sanctuary’ as described in (Korteweg, 2008). The first is a weak but functioning host that acts as a sponsor or enabler (Pakistan or Sudan for example). The potential risk to a sheltered terrorist group is that sponsorship may be revoked. This could lead to seizure of assets, imprisonment, execution, expulsion or extradition of operatives. 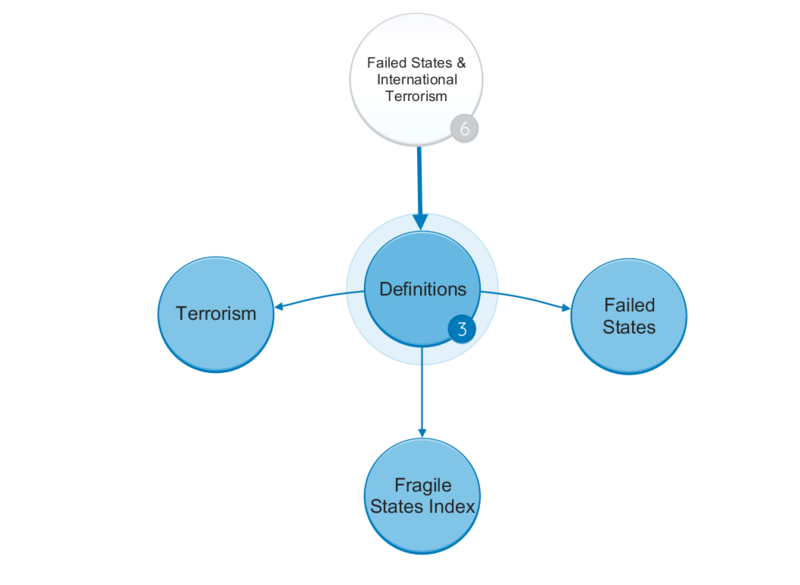 The second variant is a collapsed state in which the terrorist group can act with complete impunity due to lack of any legitimate state control (for example in Somalia). The downsides for international terrorists operating in collapsed states include risk of attack from rivals, costs of providing security, pay-offs and bribes, poor infrastructure and lack of access to the international finance system (George, 2016), (Marten, 2012 p. 15). Al-Qaeda’s links to failed states dates to the Russian occupation of Afghanistan (beginning in 1979) and the influx of foreign fighters to the region, one of which was Osama bin Laden. This brought together numerous Jihadist actors, developing networks, sharing military know-how and gaining extensive funding and battle experience. After the end of the Russian occupation many foreign fighters went to Yemen and al-Qaeda leaders were given sanctuary in Sudan. This provided a protective environment within which al-Qaeda incubated. Here they established terrorist training camps, benefited from the diamond trades in Sierra Leone and Liberia and planned the 1998 bombings of the US embassies in Tanzania and Kenya. This demonstrated the dangers that al-Qaeda posed to US regional interests and coincided with the rising importance of failed state debate in US security discourse (Wyler, 2008). Al-Qaeda could exploit porous borders, obtain passports from the Sudanese government and develop tactics and combat experience and attract new recruits. The Taliban provided refuge when al-Qaeda was expelled from Sudan and this link can be traced back to the Mujahedeen resistance and bin Laden’s personal reputation, credentials and connections in Afghanistan. Al-Qaeda provided financial support to the Taliban of between $1.5 and $3m per month (Nesser, 2016, p. 133) as well as foreign fighters and combat support against the Northern Alliance. In Afghanistan, al-Qaeda established terrorist camps and attracted tens of thousands of foreign trainees (Mobley, 2012, p. 128). Through established links in Yemen they could attack the USS Cole in 2000 (9/11 Commission, 2011, pp. 263-270). After the US invasion of Afghanistan in 2001, both al-Qaeda and Taliban fighters could exploit ungoverned territories, porous borders, tribal, ethnic and religious loyalties as well as complicity and weakness of the Pakistani state to evade capture. This enabled al-Qaeda to continue to inspire and sponsor international terrorism such as bombings in Turkey (2003), Madrid (2004), London (2005) and more recent gun attacks in Paris (Vinograd et al., 2015). Al-Qaeda central has benefited from failed states including Sudan, Pakistan, Yemen and Afghanistan. Al-Qaeda in the Islamic Maghreb (AQIM) exploits weak and failed states as it ferments instability and seeks dominance across the Sahel. This threatens regional security across a vast expanse from Algeria south to Nigeria and east to Somalia. Al-Qaeda in the Arabian Peninsula (AQAP) exploits state weakness and sectarian conflict in Yemen. Al-Qaeda in Iraq (AQI) an antecedent of Islamic State (ISIS) was founded after the 2003 US invasion. Many foreign Islamist fighters were drawn into Iraq and the failed state used as a theatre of conflict in which to attack Western and Shia targets as well as recruit and train international Sunni Jihadists. There are therefore substantive links between al-Qaeda in all its forms and failed states across Africa and Asia. There are however complex explanations ranging from a common thread of Salafi Jihadist ideology, state sponsorship of terrorism and complicity (Sudan, Pakistan) to historical factors (such as the fight against the Russians in Afghanistan in the 1980s) and affiliate terror networks (Yemen, Somalia, Iraq, Syria and others). Al-Qaeda has been very successful at using failed states to plan and conduct operations, train and recruit international and local fighters and develop battlefield capabilities. In its most prolific international attacks however power projection has been through terrorist cells in the West (Germany and the US in the case of 9/11) and the bulk of deaths and causalities it has inflicted have been within the conflict zones of Afghanistan and Iraq. Lashkar-e-Taiba (LeT) is a Sunni Jihadist terrorist group based in Pakistan. It is perhaps best known for two devastating attacks in Mumbai in 2006 and 2008. LeT is closely linked with Kashmiri independence although it traces its early history to Afghanistan and the fight against Russian occupation. Lashkar-e-Taiba is said to enjoy state sponsorship from Pakistan and has links with global Salafi Jihadist movements including al-Qaeda. LeT operates training camps in Kashmir and like al-Qaeda in Afghanistan has attracted would be foreign terrorists. The 7/7 attacks in London (Cowan and Harding, 2005) and shoe bomber Richard Reid (Tankel, 2010) are said to trace back to LeT (Stanford University, 2016b). Although operating on a smaller scale it is important to recognise similarities in the modus operandi between LeT and al-Qaeda. Both have links to the Afghan conflict of the 1980s, have established training camps within and enjoyed protection from failed states. 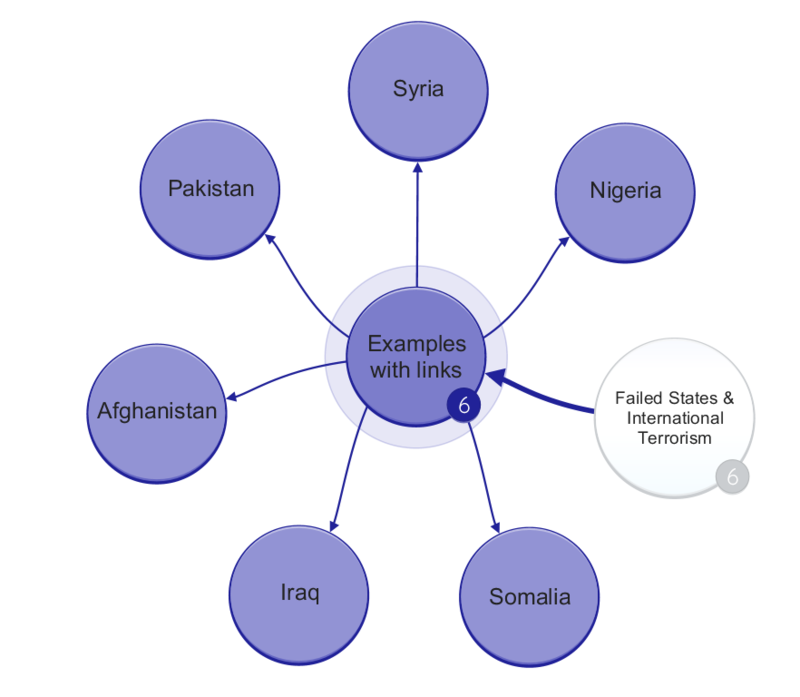 Although LeT attacks primarily regional Indian interests, it provides an important example of a ‘node’ within a global terror network that threads its operations through both strong and weak states. ISIS has arguably exploited state fragility to greatest advantage. Unlike al-Qaeda and LeT, ISIS has seized and controls large swathes of territory in Iraq and Syria. Control of resources such as oil production and taxation of local populations have generated major financial benefit. Weapons gained from defection and defeat have been significant and this demonstrates the susceptibility of weak state forces. ISIS has exploited the chaos in Libya and gained footholds in and around Sirte. Mass population flight from Syria, coupled with people trafficking in Libya combines to create a potential human security disaster. IS has also sought to attract foreign fighters into the conflict zone to repel counter-insurgency operations and defend its declared caliphate. As Western backed forces seek to reverse ISIS gains in the region, ISIS has been hitting back using its own international terror network. Suicide bomb and gun attacks against France were planned in Syria and executed from Belgium. The murder of a priest in Rouen, suicide bomb attacks at Brussels airport and Metro and the killings in Nice on Bastille Day 2016 are a handful of examples of ISIS inspired attacks in the West. The sudden and overwhelming emergence of IS across Syria and Iraq highlights additional dangers of failed states. They can (given the right circumstances) simply be overrun. As many states across the Sahel, Middle East and Horn of Africa are in similarly fragile positions, there is a risk that the ‘ISIS model’ might be repeated elsewhere. Al-Shabaab is an al-Qaeda affiliated terrorist group operating out of the quintessential failed state, Somalia. Somalia ranks as the most fragile state in the Fragile States Index (The Fund for Peace, 2016). 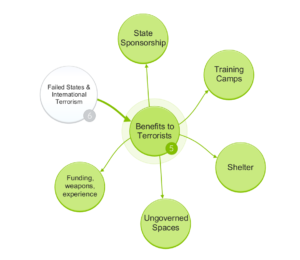 Al-Qaeda has supported al-Shabaab with financing and foreign fighters. Al-Shabaab has attacked targets outside Somalia including bombings in Uganda in 2010, the Westgate Mall attack in Nairobi in 2013 (Hansen, 2016, pp.145-147), suicide attacks in Djibouti in 2014, bus bomb attacks in Mombasa in 2014, and the Garissa University College attack in 2015 (Stanford University, 2016a). Al-Shabaab presents a transnational terrorism threat across Somalia, Ethiopia and Kenya. As an al-Qaeda affiliate, it benefits from support from fellow Salafi Jihadists. Its threat to Western targets outside of the Horn of Africa has so far been limited. It does however provide refuge, training and combat experience to other al-Qaeda operatives who may present a greater international threat. With a sizeable diaspora living outside Somalia, al-Shabaab’s threat profile extends to other countries. 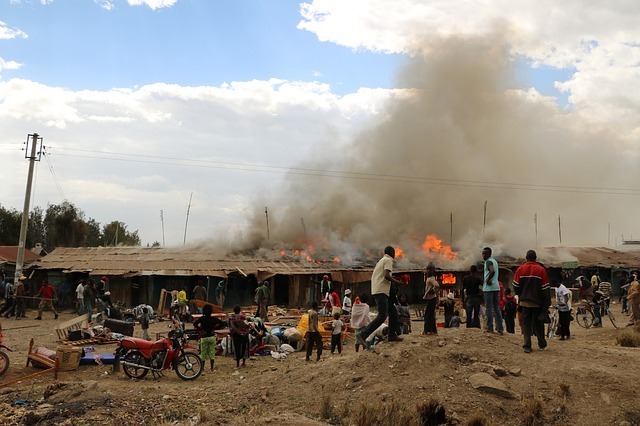 Little Mogadishu for example in Nairobi is home to a large diaspora that has both spoken out against and been accused of supporting terrorism in Kenya (Sperber, 2015). Boko Haram is an ISIS allied Islamist terrorist organisation operating mostly in northern Nigeria. It has supplied up to 1,000 fighters in support of ISIS operations in Libya. It has received support and is also linked to al-Qaeda and its affiliates across the Maghreb (Andrews, 2016, p.119). Adegbulu (2013) argues that Boko Haram’s primary threat is to the weak Nigerian government. As well as infamous murder and kidnapping attacks within Nigeria however, Boko Haram presents additional risks to regional security. It attacks across international borders into Chad, Niger and Cameroon, in the former case arguably in retaliation for joint strikes on Boko Haram by Nigerian and Chad militaries. The attraction of foreign fighters into Nigeria as well as the distribution of Boko Haram fighters into Libya highlights the dangers of international terrorist networks and the opportunities failed states provide them in terms of training, fundraising, collaboration, recruitment and radicalisation. Salafi Jihadists and their associated global terror networks are making extensive use of failed states for a variety of purposes outlined. This is however not a phenomenon unique to Sunni extremism. The conflicts in Syria and Yemen have been described as proxy wars between Saudi Arabia and Iran. It is therefore important to examine Iranian influence and Shia extremist groups such as Hezbollah. Hezbollah was formed in the early 1980s and fought against the Israeli occupation of Southern Lebanon. It is backed by Iran and has fought on the side of government troops in Syria. Hezbollah also fought in the Bosnian war against Serbian troops in the 1990s. Hezbollah has a long history of international terrorism and was involved in high profile plane hijackings throughout the 1980s. In 1992 and 1994 Hezbollah attacked Israeli targets in Argentina where it exploited the weak governance of border areas between Brazil, Argentina and Paraguay to plan and execute the attacks. Hezbollah and other Shia militants are fighting a range of Sunni groups in Syria including ISIS and the al-Nusra Front. Hezbollah exploits weak states including Lebanon (Atzili, 2007) to both attack global foreign interests (particularly Israeli) and act in regional conflict as an Iranian proxy (particularly in Syria). With the rise of global Sunni extremism and its links to failed states, there is a risk that Hezbollah and other Shia groups (for example the Houthis in Yemen) will become more involved as Iran seeks to counterbalance Saudi and Qatari influence. Links between non-Islamist international terrorists and failed states is another important consideration. The Provisional IRA developed relationships (brokered by Breton nationalists) with Gaddafi’s regime in Libya (Moloney, 2007, pp. 3-34), the Baader-Meinhof gang with the PLO in Jordan. The Lord’s Resistance Army’s violence overspills failed states across central Africa. The threats posed by non-Islamist terrorists is highly diverse but arguably quite regionalised (Logan and Preble, 2011). Terrorist actors including the IRA and ETA have ended their campaigns, radical left and right wing international terrorism has been eclipsed by Islamist violence. The increasing normalisation of relations between the West and states such as Cuba (until 2014 listed by the US as a state sponsor of terrorism) is indicative of lessening tension. It could be argued that nationalist terrorism without an overarching global ideology such as Marxism or Fascism presents a more containable threat as associated global terror networks are less pervasive. The danger of civil conflict destabilising fragile states and regions is significant however and could attract other opportunistic international actors including the various hues of Islamist extremism. Of the top 16 most fragile states ranked by The Fund for Peace (2016), South Sudan, the Central African Republic, Chad, Democratic Republic of Congo (DRC), Haiti, Guinea, Burundi and Zimbabwe can be contrasted with levels of international terrorism linked to Somalia, Yemen, Sudan, Syria, Afghanistan, Iraq, Nigeria and Pakistan. This is not to suggest that internal violence and human security concerns are not in many ways comparable. Factors such as location, ethnic and religious demographics, nature and trajectory of state weakness are important to consider (Patrick, 2006). 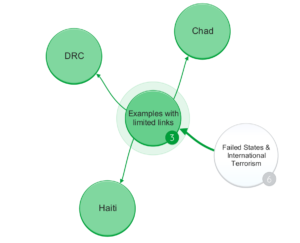 Haiti is perhaps too remote from the conflicts of the Middle East and North Africa to be of serious use to global Jihadists and provides little or no historical, cultural, religious or ideological affinity, established diaspora, welcoming regime, or supporting indigenous terrorist groups. Zimbabwe’s repressive security regime is perhaps a deterrent to international terrorists. Guinea’s increasing democratisation and lack of indigenous terrorist actors begins to explain its low terrorism rate. 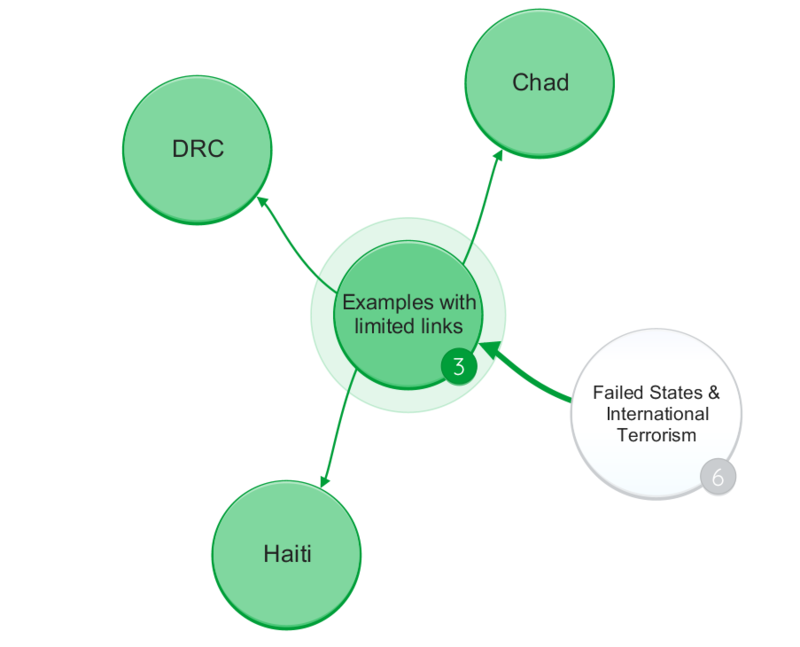 Links between international terrorists and failed states therefore exhibit certain patterns. The first pattern is the provision of shelter or support by a host government as was seen in Sudan, Pakistan and Afghanistan and with other state sponsors of terrorism such as (historically) Cuba and Libya. The second is peer to peer terrorist collaboration with indigenous actors as seen in Yemen and Nigeria. 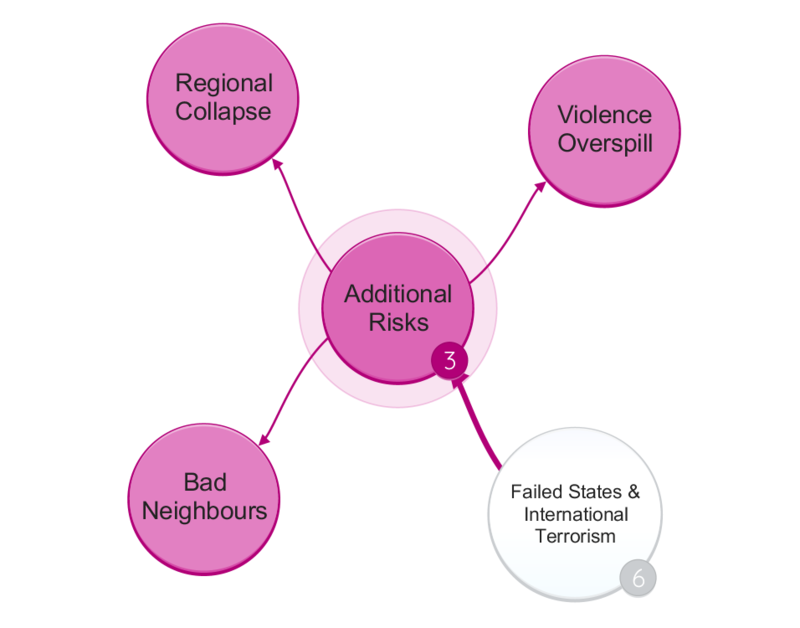 The third is the exploitation of collapsed states such as Somalia, where there is extremely low risk of governmental intervention. The forth is opportunistic capture or spillover of territories spanning failed states (for example Syria and Iraq or the DRC and surrounding countries). The fifth connects key regional powers including Iran and Saudi Arabia and traces through related proxy wars such as those in Syria and Yemen. In understanding the applicability of each pattern, it is helpful to examine the strategic, cultural, historical, religious and ideological affinity of the terrorist group and the failed state. This begins to explain why some failed states exhibit little or no discernible links to international terrorism (Coggins, 2014) and how Sunni extremists have connected numerous failed state nodes (Yemen, Iraq, Nigeria, Somalia) into their global terrorism networks. 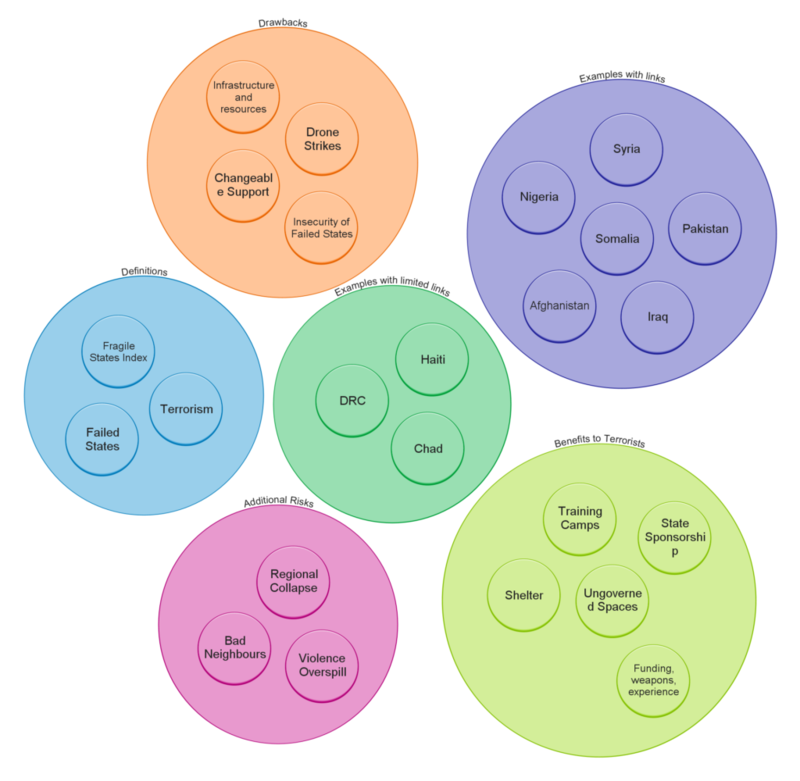 The threat profile from Sunni and Shia extremists differs both in construction and scale. Salafists exploit failed states in the context of global Jihad. As in the case of 9/11 and IS inspired attacks on the West, power projection through radicalised Westerners or Western based cells is sought. The principal Shia actor (Hezbollah) acting as an Iranian proxy exploits failed states to attack foreign interests on behalf of Iran. Dwindling numbers of left and right-wing international terrorist groups helps explain the weak link between non-Islamist international terrorists and failed states. An absence of global revolutionary ideology such as Marxism, Maoism or Fascism may explain the reduction in such conflict. The potential for left-wing terrorists be they anarchist, Marxist or Maoist to reignite global left-wing terrorism cannot be wholly discounted (for example the Naxalites in India and Maoists in Nepal). Similarly, with the rise of far-right movements across Europe a global resurgence of right-wing violence cannot be disregarded. Failed states not only correlate with international terrorism in some circumstances, but with domestic conflict, civil war and many human security concerns. Given the patterns outlined, the policy response to failed states requires tailoring on a case by case basis. Other threats including civil conflict, disease, transnational crime and human rights violations require additional prioritisation. We really hope you found our article on Failed States and International Terrorism useful and enjoyable. We’d also love to connect and develop the conversation further on Twitter & LinkedIn. Adegbulu, F. (2013) ‘Boko Haram: the emergence of a terrorist sect in Nigeria 2009 – 2013’, African Identities, 11(3), pp. 260–273. doi: 10.1080/14725843.2013.839118. Andrews, J. (2016) The World in Conflict. The Economist Books. Atzili, B. (2007) ‘Weak State and Transnational Insurgency : PLO and Hezbollah in Lebanon’, pp. 1–34. Coggins, B. L. (2014) ‘Does State Failure Cause Terrorism? An Empirical Analysis (1999-2008)’, Journal of Conflict Resolution, 59(3), pp. 455–483. doi: 10.1177/0022002713515403. Cowan, R. and Harding, L. (2005) ‘Pakistan militants linked to London attacks’, The Guardian, 19 July. Available at: https://www.theguardian.com/uk/2005/jul/19/july7.pakistan (Accessed: 26 November 2016). Easson, J. J. and Schmid, A. P. (2013) ‘The Routledge Handbook of Terrorism Research’, in Schmid, A. P. (ed.). Oxford: Routledge, pp. 99–148. Freedman, B. J. E. (2013) ‘The Routledge Handbook of Terrorism Research’, in. Oxford: Routledge, pp. 350–354. George, J. (2016) ‘State Failure and Transnational Terrorism: An Empirical Analysis’, Journal of Conflict Resolution, pp. 1–25. doi: 10.1177/0022002716660587. Hansen, S. J. (2016) Al-Shabaab in Somalia : the history and ideology of a militant Islamist group. Hurst. Kaldor, M. (2012) New and old wars. 3rd edn. Polity Press. Korteweg, R. (2008) ‘Black Holes: On Terrorist Sanctuaries and Governmental Weakness’, Civil Wars, 10(1), pp. 60–71. doi: 10.1080/13698240701835482. Logan, J. and Preble, C. (2011) ‘Fixing Failed States: A Dissenting View’, The Handbook on the Political Economy of War, pp. 379–396. Available at: http://books.google.com/books?hl=en&lr=&id=-rSF4xEMhDwC&pgis=1. Marten, K. (2012) Warlords: Strong-Arm Brokers in Weak States. Cornell University Press. Mobley, B. W. (2012) Terrorism and counter-intelligence : how terrorist groups elude detection. Columbia University Press. Moloney, E. (2007) A secret history of the IRA. 2nd edn. Penguin. Nesser, P. (2016) Islamist Terrorism in Europe. Hurst & Company. Patrick, S. (2006) ‘Weak States and Global Threats : Fact or Fiction ?’, The Washington Quarterly, 29(2), pp. 27–53. Patrick, S. (2007) ‘Failed States and Global Security: Empirical Questions and Policy Dilemmas’, International Studies Review International Studies Review, 9(9), pp. 644–662. Available at: http://www.jstor.org/stable/4621865 (Accessed: 30 October 2016). Patrick, S. (2011) Weak links : fragile states, global threats, and international security. Oxford University Press. Piazza, J. A. and James, A. P. (2008) ‘Incubators of Terror : Do Failed and Failing States Promote Transnational Terrorism ?’, Source: International Studies Quarterly, 52(3), pp. 469–488. Available at: http://www.jstor.org/stable/29734247 (Accessed: 30 October 2016). Pilbeam, B. (2015) ‘International security studies : theory and practice’, in Hough, P., Malik, S., Moran, A., and Pilbeam, B. (eds). Oxford: Routledge, pp. 104–118. Rotberg, R. I. (2003) State failure and state weakness in a time of terror. World Peace Foundation. Silke, A. (2008) ‘Research on Terrorism’, Integrated Series in Information Systems, 20043460(18), pp. 27–50. doi: 10.4324/9780203500972. Simons, A. and Tucker, D. (2007) ‘The misleading problem of failed states: a “socio-geography” of terrorism in the post-9/11 era’, Third World Quarterly, 28(2), pp. 387–401. doi: 10.1080/01436590601153887. Sperber, A. (2015) Little Mogadishu, Under Siege. Available at: https://foreignpolicy.com/2015/04/14/kenya-shabab-somalia-garissa-kenyatta/ (Accessed: 26 November 2016). Stanford University (2016a) Al Shabaab, Mapping Militant Organisations. Available at: http://web.stanford.edu/group/mappingmilitants/cgi-bin/groups/view/61 (Accessed: 18 November 2016). Stanford University (2016b) Lashkar-e-Taiba, Mapping Militant Organisations. Available at: http://web.stanford.edu/group/mappingmilitants/cgi-bin/groups/view/79 (Accessed: 20 November 2016). Tankel, S. (2010) The Long Arm of Lashkar-e-Taiba. Available at: http://www.washingtoninstitute.org/policy-analysis/view/the-long-arm-of-lashkar-e-taiba (Accessed: 26 November 2016). The Fund for Peace (2016) Fragile States Index 2016. The National Security Strategy of the United States (2002) ‘The National Security Strategy United States of America’, (September), pp. 1–31. Available at: http://www.state.gov/documents/organization/63562.pdf. Vinograd, C., Jamieson, A., Viala, F. and Smith, A. (2015) Charlie Hebdo Shooting: 12 Killed at Muhammad Cartoons Magazine in Paris, NBC News. Available at: http://www.nbcnews.com/storyline/paris-magazine-attack/charlie-hebdo-shooting-12-killed-muhammad-cartoons-magazine-paris-n281266 (Accessed: 26 November 2016). Wyler, L. (2008) ‘Weak and Failing States: Evolving Security Threats and U.S. Policy’, Congressional Research Service, p. 37.